NASHVILLE, TN — George C. Hill retired from his post as vice chancellor for equity, diversity and inclusion as of July 1. He will immediately resume his role as professor emeritus in medical education and administration and professor emeritus of pathology, microbiology and immunology. Hill has served as the first vice chancellor for equity, diversity and inclusion and as the university’s first chief diversity officer since November 2015. As vice chancellor, Hill led collaboration with the chancellor’s Committee on Diversity, Inclusion and Community and advisory committees for students, faculty and staff. He held listening sessions across campus, launched the university’s unconscious bias training initiative and the university’s first Community Profile. In addition, he created multiple communications channels, including a new website and two new e-newsletters to promote inclusive events and highlight the work and accomplishments of diverse students, faculty and staff. Hill also partnered with the deans of the schools and colleges to sponsor the Emerging Scholars program, which features visits by promising young minority and underrepresented scientists who are making notable discoveries as postdoctoral fellows or early career faculty. Hill’s office also partnered with the deans to initiate a seed grant program in the spring of 2017. The program funded 29 peer-reviewed proposals for pilot research or developmental projects on equity, diversity and inclusion. It has been an honor to serve Vanderbilt University in this very important role. I look forward to the university’s continued progress in advancing the voices of and opportunities for all members of its community. “Vanderbilt University understands its history and the imperative and the challenges to advance inclusive excellence in everything it does—from educating the next generation of leaders to conducting groundbreaking research to forging critical relationships and discussions with all campus populations,” Hill said. “It has been an honor to serve Vanderbilt University in this very important role. I look forward to the university’s continued progress in advancing the voices of and opportunities for all members of its community. “I am particularly appreciative of the staff of the Office for Equity, Diversity and Inclusion and their excellent commitment to the goals and mission of inclusive excellence,” Hill noted. In 2016, the office received the Caldwell Award from Vanderbilt Student Government for its commitment to advancing student initiatives and communication. Hill’s 2015 appointment as vice chancellor followed a path-breaking career as a scientist and educator. He served as assistant vice chancellor for multicultural affairs and special assistant to the provost for health affairs from 2011 to 2012. 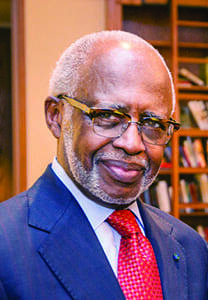 From 2002 to 2011, he served as the first associate dean for diversity in medical education. A member of the National Academy of Medicine within the National Academies of Sciences, Engineering and Medicine since 1998, Hill was elected a fellow of the Academy of Microbiology in 2002. In 2011, he was elected a fellow of the American Association for the Advancement of Science. The AAAS cited Hill’s leadership as president of the National Foundation for Infectious Diseases, his work advancing a diverse workforce and his contributions to tropical diseases research. Hill was elected a fellow of health disparities of the Cobb Institute of the National Medical Association in 2014 and received the first honorary doctor of science degree awarded by the Cooper Medical School of Rowan University in May 2016.